I recently saw this quote pop up on my newsfeed on Facebook and it instantly made me think of the Camino, a topic that seems to be very prominent in my thoughts lately. Even before I officially decided to walk the Camino I have been trying to convince my friend Barbara to join me. It has started to dawn on me that she might not be able to join because a little thing called life just happens to get in the way. I asked a few other friends if they were interested and their response was the same – they’re too busy living life – fair enough. Perhaps I could find someone in my list of acquaintances that would put their life on hold for a month, but as per this quote, I wouldn’t want a random acquaintance to join me if they wouldn’t make a good companion. My mother is planning on joining me for the last 100km, but it has started to dawn on me that I might just be walking alone for the majority of my Camino (Barbara you still have time to figure it out and join!). It is going to be just like starting afresh in a new city, with a whole new environment and routine to get accustomed to, and a whole new set of people to meet and befriend. At this point in my life I feel like I have done enough of just that – moving to a new city and not knowing anyone; having to start life over. I feel like I’m finally starting to get comfortable and familiar with this new city where I moved to almost 2 years ago, which I will soon be leaving. Then I think back to all the times that I have moved, traveled, or done something new, and how it has changed me, my perspective on the world and on myself; Those experiences have strengthened me and molded me into the person that I am today. As much as I get anxiety about adding this new chapter to my life and stepping foot on the 800km path across Spain, I am excited to prove to myself that I am brave enough to walk alone if I have to. Thankfully, I’ve heard that one is never truly alone on the Camino; that the Camino will provide. I’m not sure what I need to be provided with, but I’ll go and find out. There are two things that could happen – this walk may be a time of reflection and a spiritual journey to help me find some clarity, or otherwise it may just be a really really long walk where I’ll get an abundance of blisters and perhaps shed a few pounds. The ending is yet to be determined. The Camino offers so much, including the opportunity to be on your own, or close to others. There is comaraderie unlike any other travel experience, but if you want some solitude, it is there as well. I expect that after a day or two on the Camino, you will find a path that works for you. If you want to see some of our experiences, check out carryoncouple.com. It’s definitely good in that you can decide whether to be alone or be social. I’m looking forward to it! 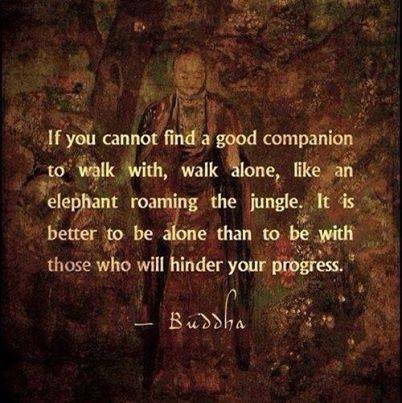 To walk alone and be glad of the company is a wonderful thing. Getting away from everyone else can be a great opportunity to get to know ourselves. Lesson #1….you are “NEVER,” alone on the Camino. #2 you are never alone when you finish the Camino.. #3 This is a real trip…..enjoy the moment, have fun! Thanks for the link to my blog. Sounds like an incredible and exciting adventure awaits you! It’s making me all eager to do this walk someday too :) All the best and looking forward to hearing more about the walk. I have heard so many wonderful things about the Camino – and I think it would be a powerful experience to do it solo. Best of luck. Wow! Good for you. And I moaned about running for a couple of hours yesterday.